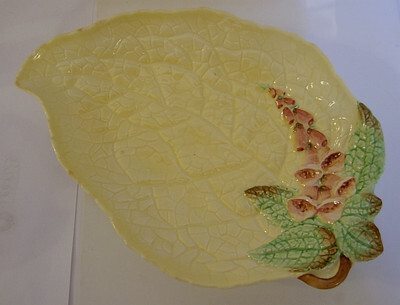 One of the very popular sizes in the Foxglove Pattern from Carlton Ware. This one is a Larger Serving Dish in the yelow ground design. As with all this range, it is a vintage Australian registered design handpainted dating from the 1940s period. It has a very detailed and intricate design of embossed purple foxgloves to one end.It is appropriately backstamped and has the impressed shape number 1870. It is 9.5 inches (24 cms) in length. The Dish is in perfect condition with no evidence of crazing.